I usually know my tastes pretty well. I can look at a recipe and know whether or not it would be something that I would like or not. However, when I saw this recipe I thought “This will probably be alright, I should try it”. However, I was really wrong with this one. It was better than alright, I loved it. I demolished just about all of it by myself for lunch one day. It is SO SUPER simple as well! And don’t be afraid of all that cilantro. Cilantro is a funny thing, either you like it or you don’t. There aren’t a whole lot of people on the fence with cilantro. And because cilantro’s stems are tender and mild in flavor you can go ahead and throw them in the food processor as well, saving time! In a food processor, combine cilantro, garlic, ginger, vegetable and sesame oils, red-pepper flakes, lime zest and juice, brown sugar, and 1/3 cup peanuts. Pulse until a coarse paste forms. Season with soy sauce and pulse to combine. 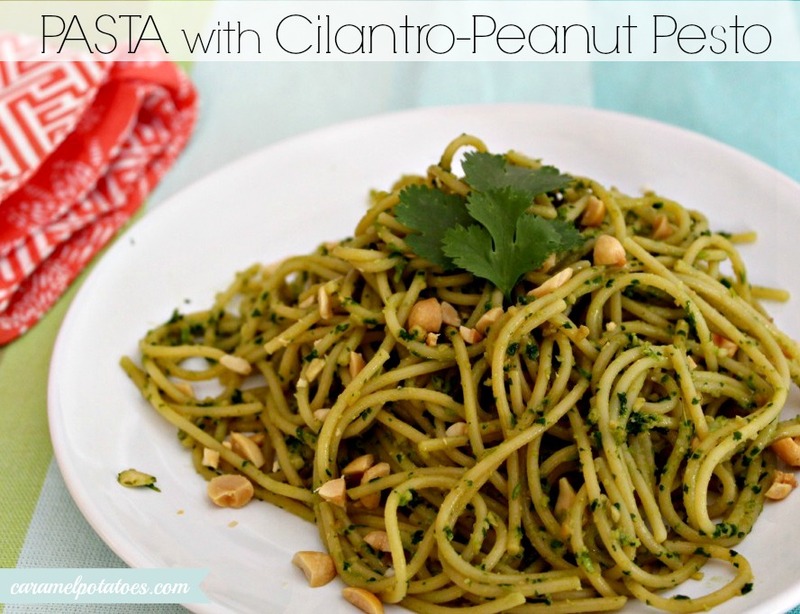 In a large bowl, toss pesto with pasta. Sprinkle additional chopped peanuts and reserved cilantro leaves over top. Hi there, just letting you know that you are in my Featured Food Blog sidebar for March on Carole’s Chatter. Have a great week. Great idea…and I just bought a ton of cilantro! Sounds yummy. Sending this on to a friend who is a cilantro lover.